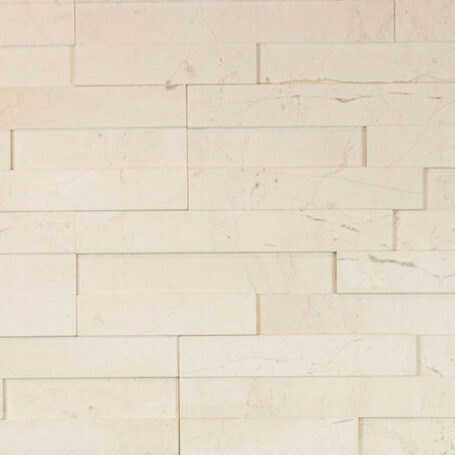 Buy Alesio Creme Honed natural stone panels by Realstone Systems at Tango Tile. Alesio is sophisticated collection of marble and unfilled travertine natural stone cladding. Each individual panel is 6” x 24” with 3 rows of stone in each 6” rise. Shown here in Creme Honed. Sold by the box; each box contains 6 pieces, totaling 6.0 square feet ($19.25/square foot). The Alesio™ Collection is the latest addition to our ever growing product offerings. Ranging from the exotic wood look of Spalted Oak to the refined neutrals of Creme and Smoky Beige, each unique piece of stone in Alesio brings natures incomparable beauty to any project.